Scores of Women’s Sacred Music Project supporters joined in the happy celebration of its twentieth anniversary at the dinner October 15, 2015 at the Overbrook Golf Club. The Rev. Erika Takacs and the Boys and Girls Choir of St. Mark’s Church, Locust Street, sang musical tributes to the honorees, the Rt. Rev. Frank Griswold, former Presiding Bishop of the Episcopal Church, the Rt. Rev. 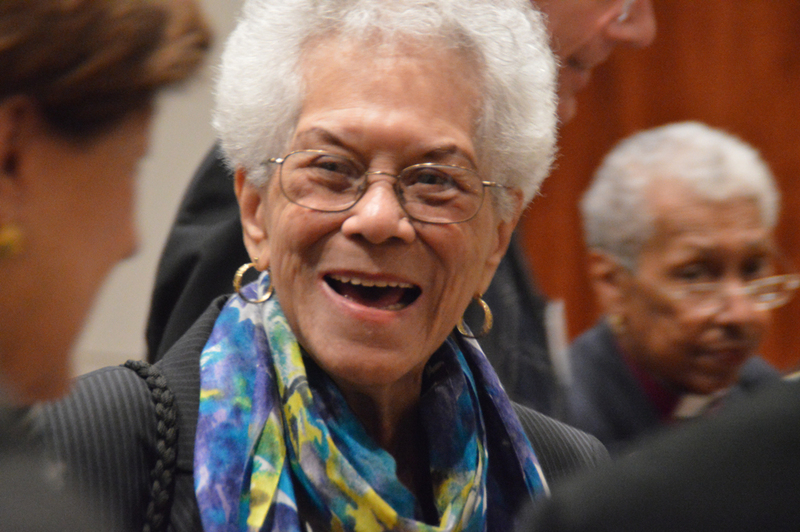 Barbara Harris, retired Suffragan Bishop of Massachusetts, and Rosemont College. Each of the honorees had been key supporters in the beginnings of the WSMP. The dinner climaxed a significant fundraising campaign to provide a solid base for the future work of the group. The WSMP board set aside funds as the Margaret M. Healy Commission Fund, to enable the WSMP to commission works carrying forward the mission of the Women’s Sacred Music Project. Margaret Healy, former President of Rosemont College, has been a strong, generous, and longtime leader and supporter of the Project and recently retired from the Board. She was the key leader in this campaign. The remainder will make possible the important “Mothers of Moses” performance on October 6, 2016 at Rosemont College, and other WSMP initiatives. At the dinner Lisa Thomas, President of the Women’s Sacred Music Project, introduced composer Rene Orth, who will be composing for the October 16 event. The WSMP is deeply grateful to all who made possible these significant steps forward.